The winter months bring a buildup of Holiday Cheer - along with a buildup of dry air and the ensuing static electricity. More than a simple shock, static electricity challenges manufacturing companies and plants during the winter months, particularly in their packaging and labeling processes where plastic surfaces hold a high resistance to electricity and work as insulators, causing static buildups. Static may prevent label liners from neatly respooling or cause them to stick to each other and other equipment, damaging labels or disrupting the application process. In some cases, accumulation of static electricity can cause anywhere from a light shock to electrical sparks and even risk of a fire. For this reason, tools that can kill or neutralize static, like Vortec’s ionizing Air Knives, are increasingly important in the winter months. Why Is Static A Problem for Manufacturers and How Do We Fix It? Static electricity is a common problem that affects a variety of industries and manufacturers around the world. Anyone from packaging plants, bottling facilities and plastic producers need to control and reduce static electricity. As these industries continue to increase the speed of their lines and move towards more synthetic materials, all to increase production and decrease cost, the effects of static electricity greatly increase. This leads to a number of quality, productivity and safety issues, anything from dust contamination to potential fire hazards. Personal Air Conditioners (PACs) are a type of specialty clothing that is designed to maintain healthy body temperatures in extreme environments, making employees more comfortable and productive. Cooling vests can counter-act the negative effects of both dangerously high and low temperatures that can cause harm to workers, including fatigue and stress. Combustible vapors, liquids, gases or flammable dusts are often present in many industrial applications. These materials are safe in small amounts, but when they exist in abundance they become a hazard, with the possibility to wreak havoc on production processes and endanger the lives of employees. In more ways than one, custom injection molding is a hot industry. It’s a competitive market, with a wide array of industries that demand injection molded components, each requiring a different approach to design, tooling, production and quality. There’s also the fact that molding plastic components requires the injection of molten materials at very high temperatures. Can Vortec Hazardous Location Enclosure Coolers Be Used Without A Purged System? A customer contacted ITW Air Management: Vortec about an application for an ATEX Vortex AC enclosure cooler. The customer’s enclosure was in an ATEX Zone 2 location but the customer stated that the components within the enclosure were already rated and approved for the hazardous location, so they said there was no requirement for a purge system. In a small corner of dry, arid Colorado, inside a small electric enclosure, a compact but highly advanced piece of technology is helping to keep the power on for thousands of houses across a four-state region. This generation and transmission facility supplies power to dozens of power companies throughout Colorado, Nebraska, New Mexico and Wyoming, producing over 11 million megawatt-hours of power through coal, natural gas, and renewable sources. Many companies struggle with compressed air issues. At the heart of it all is ensuring that you maintain the right pressure to ensure your compressed air tools are working effectively. You may be spending money to operate your air compressor at a pressure that is higher than necessary just to generate the pressure needed at the tool’s point of use. If so, then there may be problems with the supply side of the system. For Max Imaging & Electrical, an electrical service company outside of Atlanta, Georgia, their bread and butter is well, bread and butter. Among other clients, Max Imaging services the automation controls on food facilities that bake bread and deep fry products. Baking is a messy business, and mass producing breads, pies and fried goods is a messy industry: flour, breading and batter cloud the air and air conditioners take the brunt of the beating. When the air conditioners on control panels and electrical enclosures goes down, temperature goes up, causing production to shut down for repairs. That’s just the way the cookie crumbled, until Chuck Cohran, President of Max Imaging & Electrical found Vortex Enclosure Coolers from Vortec. 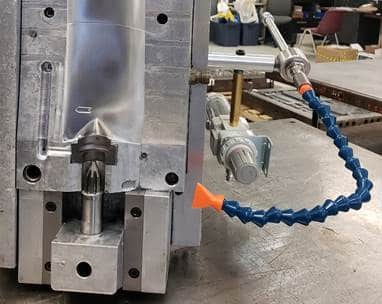 A large domestic component repair facility that specializes in re-building and testing hydraulic, electro-mechanical and fuel system components for the aerospace and aviation industries needed a solution to cool a fuel control valve for one of their customers. The control valve must accurately regulate fuel flow in response to the temperature. One of the tests required the valve to be cooled to -25°F plus or minus 2°, and the fuel flow measured.